Share market today: Sensex and Nifty snapped a 5-day losing streak and closed Tuesday's volatile trade session on a higher note. 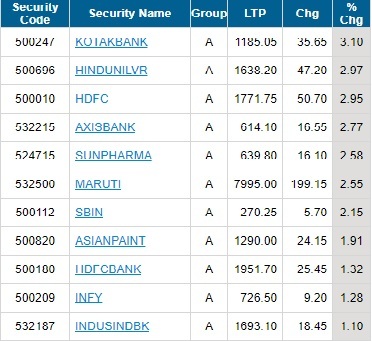 Index heavyweights HDFC-twins, Kotak Bank, Infosys, Axis Bank, HUL, Maruti Suzuki and ITC were the top contributors to the Sensex index. Initially, the share market had opened on a lower note tracking weak global cues and a lower opening of the Indian rupee. Asian stocks struggled on Tuesday as a fresh round of U.S.-China tariffs and a surge in oil prices to near four-year highs added to worries about risks to global growth, said a Reuters report. State-owned insurer LIC Tuesday said it will not allow debt-ridden IL&FS to collapse and explore options to revive it. The Life Insurance Corporation (LIC) has the largest shareholding in IL&FS. IL&FS Financial Services, a group company of IL&FS defaulted on one of its commercial paper (CP) issuances due for repayment on Monday. This was the third default by the company. LIC Chairman V K Sharma, after a meeting at the finance ministry, assured that efforts are being made to keep IL&FS afloat, PTI reported. Sterling rose for a second day on Tuesday as risk appetite improved and expectations of a Brexit deal grew, prompting investors to buy the pound after a selloff last week, said a Reuters report. In early London trading, sterling rose a quarter of a percent to $1.3153 as traders covered some of their short positions. In the national capital, gold of 99.9 per cent and 99.5 per cent purity shot up by Rs 175 each to Rs 31,725 and Rs 31,575 per 10 gram, respectively. Sovereign, however, remained flat at Rs 24,500 per piece of eight gram, said a PTI report. Silver ready also strengthened by Rs 190 to Rs 38,290 per kg and weekly-based delivery by Rs 200 to Rs 37,725 per kg. Silver coins, however, remained unaltered at Rs 72,000 for buying and Rs 73,000 for selling of 100 pieces. The Sensex jumped nearly 375 points to an intra-day high of 36680.58 points during late-afternoon trade deals. 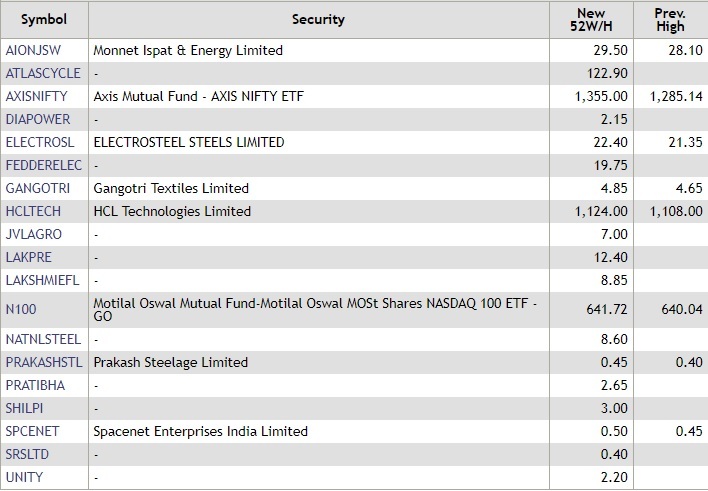 Share markets turned extremely volatile during late afternoon deals on Tuesday, with realty, auto, media, PSU banks and metals sectors adding to the losses of Sensex and Nifty. 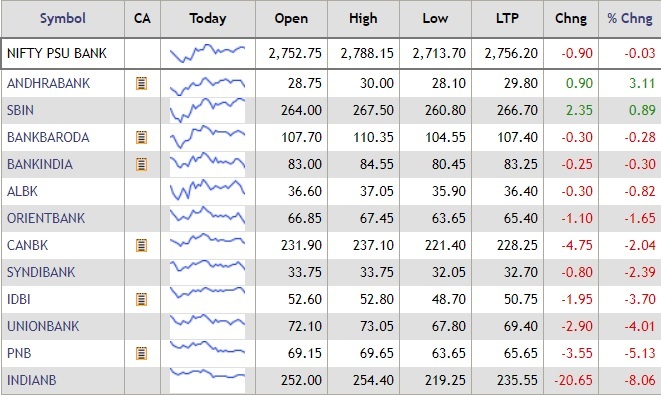 However, the key indices managed to hold on to gains on the back of good buying activity in index heavyweights. Around 2.45 pm, the Sensex traded 131.08 points or 0.36% higher at 36,436.10 points. Indiabulls Housing Finance stock cracked nearly 12% on the BSE. Britain's top share index edged up on Tuesday thanks to a surge in oil majors as crude prices hit a four-year high, while retailer Next stole the spotlight after a strong update confounded expectations. The FTSE 100 rose 0.2% by 0825 GMT, boosted by energy stocks and miners, reported Reuters. Next shares jumped 8.5% to the top of the FTSE 100 after it raised its full-year profit forecast and struck an optimistic tone on a no-deal Brexit, saying it is well prepared for the eventuality. Pen manufacturer Flair Writing Industries has filed its draft papers with markets regulator Sebi to raise funds through an initial public offer. The IPO comprises equity shares of face value of Rs 10 each of Flair Writing aggregating up to Rs 450 crore, according to the draft red herring prospectus (DRHP) filed with Sebi. The offer comprises a fresh issue aggregating up to Rs 330 crore and an offer for sale of up to Rs 120 crore. DHFL shares continued to plunge in late afternoon deals on Tuesday, slumping nearly 34% to an intra-day low of Rs 260.10 per share on the BSE. Around 2.25 pm, shares of DHFL traded at Rs 280, down 28.75%. DHFL shares had surged nearly 25% on Monday after a 60% plunge on Friday. 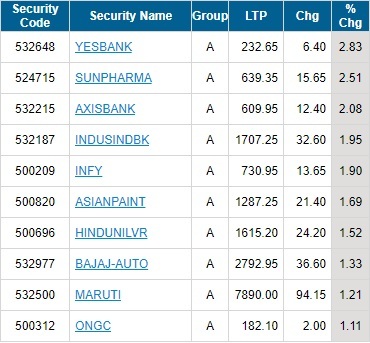 Yes Bank shares have suddenly plunged deep into red in the afternoon trade, falling as much as 9% from yesterday's close, against mostly trading in the green since morning. Yes Bank stock is trading at over 2-year low of near Rs 205 per share. The board is to meet today to primarily decide on a successor for CEO Rana Kapoor, who was asked by the RBI to step down. Telecom infrastructure player GTL Group shares cracked up to 5% after Canara Bank moved the National Company Law Tribunal (NCLT) after the company defaulted on its debt repayment. While GTL has defaulted on Rs 459 crore loans from the bank, GTL Infrastructure owes Rs 541 crore to the lender. GTL shares were trading down around 2%, while GTL Infra was trading down at 5%. Tata Steel's acquisition of Usha Martin's speciality steel business will improve the share of long steel products in its business at no additional leverage, says a report. Tata Steel, which has a capacity of 27.5 million tonne, has a disproportionate skew towards flat steel products now while Usha Martin has an integrated steel-making business with predominantly long steel products which get better margins. 'At the proposed transaction value of Rs 4,300-4,700 crore, we do not expect the acquisition to have a material negative impact on Tata Steel's financial profile or leverage. We expect the company to pay in cash for the acquisition, which is through a slump sale. The acquisition will also improve its product portfolio,' PTI reported quoting a note from S&P. In a regulatory filing to the BSE, Canara Bank said it has floated Request for Quotes (RFQ) by inviting bids in order to Offload Unquoted Equity Shares through Swiss Challenge Method in various companies. Check Canara Bank share price here. 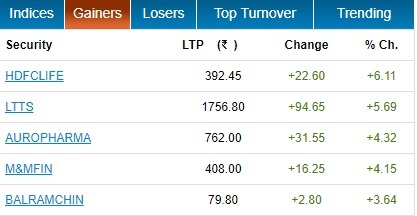 The S&P BSE midcap and smallcap indices traded with losses on Tuesday, even as the headline Sensex index surged 281 points to an intra-day high of 36,586.38 points. At 12.15 pm, the midcap index was trading lower by 37.21 points or 0.24%, while the smallcap index was down 83.16 points or 0.54%. 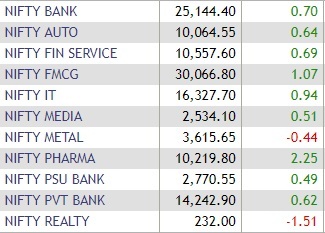 DHFL (down 19.58%) was the top drag on the S&P BSE midcap index. Housing finance company Aavas Financiers has opened its initial public offer for subscription today. The price band for the public issue has been fixed at Rs 818-821. Aavas Financiers aims to raise Rs 1,734.07 crore through its issue. The IPO will close on September 27. Oil prices hit their highest since November 2014 on Tuesday, topping four-year highs from the previous day, as looming U.S. sanctions against Iran and reluctance by the Organization of the Petroleum Exporting Countries to raise output supported markets, said a Reuters report. Brent crude futures rose to $81.62 a barrel around 0600 GMT, levels not seen since November 2014. They were still at $81.61 at 0610 GMT, up 41 cents, or 0.5 percent from their last close. U.S. West Texas Intermediate (WTI) crude futures were at $72.37 a barrel, up 29 cents, or 0.4 percent from their last settlement. Almost all Asian currencies struggled on Tuesday as the dollar firmed ahead of an expected Federal Reserve rate hike, while U.S.-China trade tensions continue to cloud the global outlook. According to a Reuters report, the Fed begins its two-day policy meeting later on Tuesday where it is expected to raise interest rates for the eight time since late 2015. Markets are also betting on another rate hike before year-end, though the outlook for 2019 is less clear. The dollar index against a basket of six major currencies strengthened 0.2 percent to 94.341. Capacit'e Infraprojects has bagged orders worth Rs 675 crore from two different clients. "Capacit'e Infraprojects has received order from Piramal Realty and Radius Group for a total contract value of Rs 674.75 crore," the company said in a BSE filing. The company said the it has received an order worth Rs 560.90 crore from Piramal Realty and an order worth Rs 113.852 crore from Radius Group. Asia stocks struggled on Tuesday as a fresh round of U.S.-China tariffs and a surge in oil prices to near four-year highs added to worries about risks to global growth, according to a Reuters report. MSCI's broadest index of Asia-Pacific shares outside Japan edged down 0.15 percent. But Japan's Nikkei bucked the trend and edged up nearly 0.2 percent. The Shanghai Composite Index dropped 0.7 percent and Australian stocks eased 0.1 percent. Hong Kong markets were closed for a holiday. Biocon's contract research arm Syngene International has announced the resignation of Manoj Nerurkar as Chief Operating Officer with effect from October 1, 2018. The announcement of the appointment of his successor will be made shortly, the company said in a BSE filing. The Indian rupee recovered 18 paise from it's day low during mid-morning trade deals to 72.7813 per US dollar. In early morning trade, the rupee had weakened by 33 paise to 72.96 against the dollar. Shares of Dewan Housing Finance (DHFL) tanked 22% on the domestic bourses on Tuesday after the company held an analyst meet on Monday with regard to recent developments in the market. DHFL shares had surged nearly 25% on Monday after a 60% plunge on Friday. The Nifty 50 index of the National Stock Exchange reclaimed the 11,000-mark during mid-morning deals on Tuesday. The Nifty rose 42 points to an intra-day high of 11,009.50 points. Private sector lender Yes Bank's shares rose over 3% on Tuesday ahead of its board meet scheduled for later during the day. The bank's board is scheduled to meet later in the day to decide the future course of action after the central bank last week curtailed CEO and MD Rana Kapoor's term until Jan 31, 2019 Bank and its MD and CEO will be fully guided by its board, RBI and other relevant stakeholders, Yes Bank said in a statement. 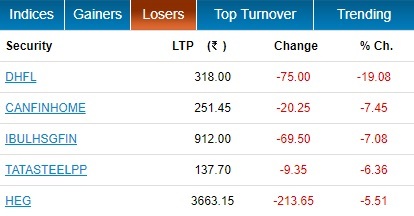 NBFC stocks continued to decline on Tuesday over liquidity concerns. DHFL shares declined for the third consecutive day and fell 12.60% during morning deals on the NSE. Indiabulls Housing Finance was down 5.49%. Continuing its slide, the rupee weakened by 33 paise to 72.96 against the US dollar Tuesday, hurt by increased demand for the American currency from importers as global crude oil prices hit four-year high. Besides sustained demand of the US currency from importers and dollar's strength against some currencies overseas ahead of US Federal Reserve's meet, a lower opening in the domestic equity markets too weighed on the domestic unit, PTI reported traders as saying. The BSE Sensex closed Monday’s trade at over a two-month low of 36,305.02 points, down 536.58 points or 1.46%, while Nifty closed 168.20 points, or 1.51% lower at 10,974.90 points.